Conman or trainer? Who is Arumugam, the man arrested for TN girl’s death? G Arumugam, the trainer who pushed Logeswari down, was arrested on Thursday night and charged for culpable homicide not amounting to murder. On Thursday evening, 19-year-old Logeswari, a second year BBA student at the Kalaimagal College of Arts and Science, was made to stand on the ledge of the second floor in her college. As part of a disaster management drill conducted at the college, a trainer stood next to her, and when Logeswari looked reluctant to jump down, he pushed her. Logeswari hurtled down onto a net that her classmates were holding. But without a harness, her head first hit the parapet wall on the first floor, and then she landed motionless into the net. G Arumugam, the trainer who pushed Logeswari down, was arrested on Thursday night and charged under section 304 of the Indian Penal Code, for causing death due to negligence. But who authorised Arumugam to conduct the training at the college, that too clearly without proper safety measures in place? 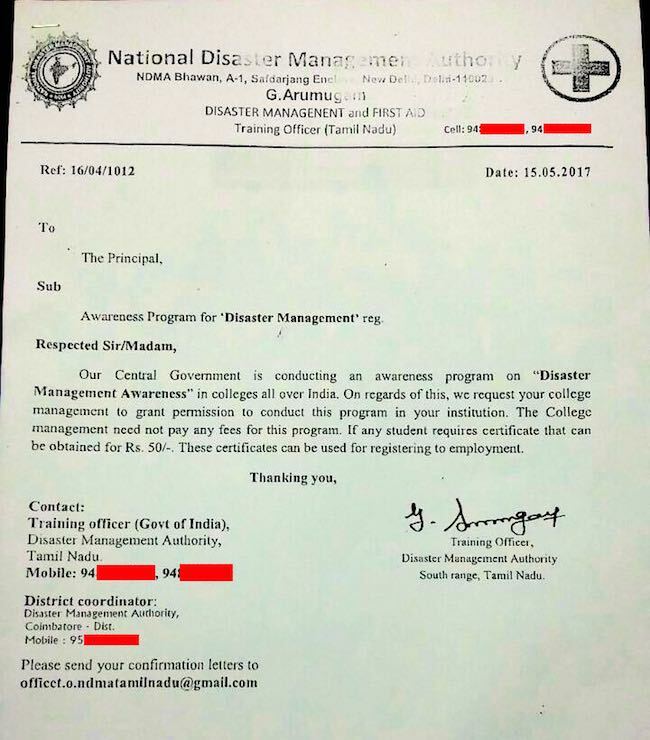 A note sent by the college inviting the media in Coimbatore to cover the event, called Arumugam a trainer officer with the National Disaster Management Authority (NDMA). It added that the event was being organised by the National Service Scheme (NSS). 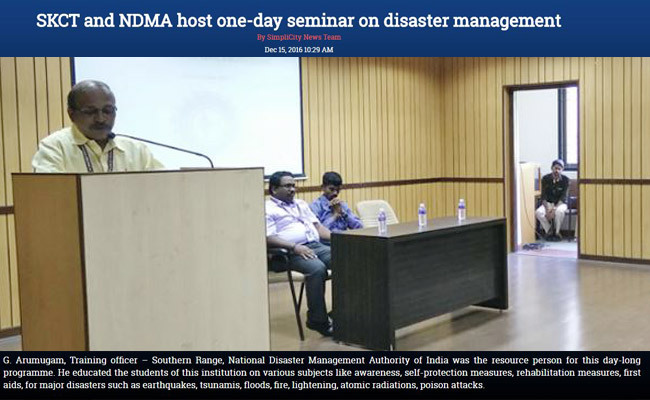 In his Facebook profile, Arumugam has described himself as a trainer with NDMA. However, the national agency whose primary purpose is to coordinate response to natural or man-made disasters, denied their involvement. In a tweet, the NDMA said that they had not organised the drill at the college. NDMA member Kamal Kishore told TNM that Arumugam is not a trainer appointed by them. "We have a certain criteria when it comes such forms of training. We collaborate with the local emergency services. Jumping off the second floor is definitely not part of our training programme," he said. But a top police officer from Coimbatore told TNM that G Arumugam has claimed he was a central government employee. 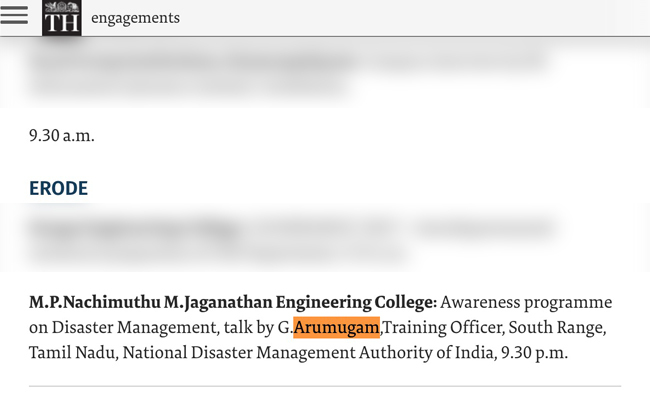 "During our preliminary enquiry, Arumugam has said that he got a diploma in the field of Disaster Management from the National Institute of Disaster management in New Delhi. He claims to have received his appointment order as a trainer from the Ministry of Home Affairs. He receives his salary from the central Government. He has been conducting awareness campaign and demonstrations in various colleges. We are yet to verify his claims," said a top cop in Coimbatore district. "The college had invited him for the training. But he is not a field officer. He seems to be more of an academician who conducts classroom training. But he has gone ahead and made students jump without adequate safety measures. He should not have involved students in the process. We are taking stringent action against him and booking him under Section 304 of the IPC (Punishment for culpable homicide not amounting to murder)." TNM has found at least two news reports that mention Arumugam. One report mentions him as part of a training class at the Sri Krishna College of Technology in December 2016. He has been described as "G. Arumugam, Training officer – Southern Range, National Disaster Management Authority of India." Another report from February 2017 says that G Arumugam was conducting a class at M P.Nachimuthu M.Jaganathan Engineering College in Erode. However, police sources say they are verifying if he was an impersonator or was using fake credentials. They suspect that he may not have been part of NDMA, as a letter written by Arumugam to a college principal in May 2017 mentions a Gmail ID, and while it lists at least three different mobile numbers, there is no landline number listed for the supposed “Training Officer (Tamil Nadu) – whose address is in Safdarjang Enclave, New Delhi. The letter also has the mobile number for a “district coordinator” of the Disaster Management Authority in Coimbatore. The NSS too claimed they were unaware of such a fire drill exercise. Regional Director of NSS, Samuel Chelliah told TNM that, usually, NSS units in educational institutions invite officers from Fire and Rescue Department to organise such drills. "NSS volunteers do not conduct drills, they only organise. I have asked for a report from my officer in Coimbatore. But as of now we have no such information that this drill was conducted by NSS," he said. When asked who Arumugam was, Samuel said he could be a private trainer, and that a lot of institutions engaged such people.